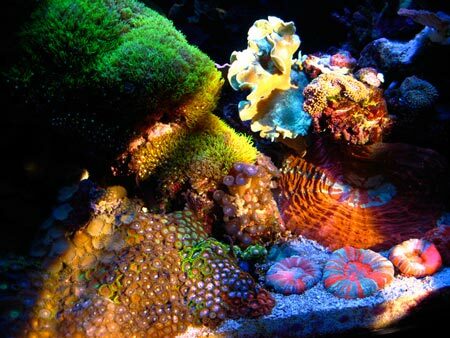 Origins: "Man, you should really set up a reef tank." 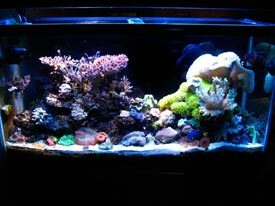 Ironically, my entry into the reef tank hobby did not grow out of a lifelong passion for aquarium keeping. 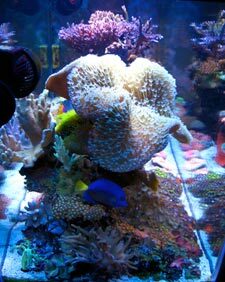 While I've always had an affinity for the Natural World and had kept goldfish and tetras as a child, a 35 gallon tank with a lone Cichlid and even a large Koi pond for a number of years, I had never maintained a marine tank of any kind. 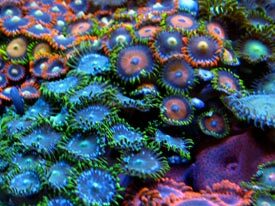 My passion was with the terrestrial world-- specifically, the collecting and growing of bonsai trees, miniature landscapes, and exotic tropical & succulent plants. As an outgrowth of my career as a graphic designer I also dabbled in landscape design in a personal effort to extend my artistic skills to nature. Living in coastal Southern California gave me ample access to many specialty gardening clubs, nurseries and year 'round sun and agreeable climate to take advantage of. 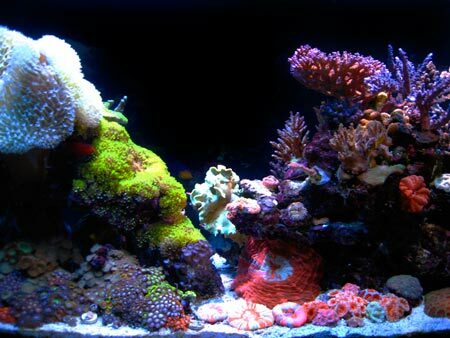 That all changed around late 2004 when a friend I met through plant circles was visiting at my house and after viewing my plant collection, said the words opened up a whole new world for me: "Man, you should really set up a reef tank..."
He left me an issue of a saltwater aquarium hobby magazine he had in his car. 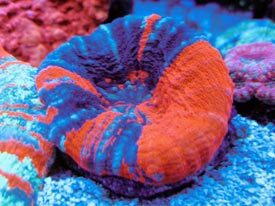 I thumbed through the magazine and was amazed at the incredible colors, shapes and forms of the aquascapes and living corals and fish. I immediately thought to myself, "This is just like gardening, but underwater. I must do it." Needless to say, I was hooked and subsequently starting reading every book and website I could find on the subject. 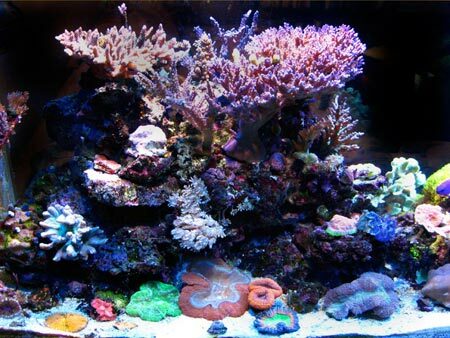 One month later I set up my first reef tank-- a 6 gallon JBJ NanoCube. That little tank was a great way to enter the hobby and familiarize myself with its intricacies (the extra hands-on "work" involved with maintaining a small tank was a great learning experience for me) but, as is the usual course of events in this hobby, soon realized I wanted something larger. My opportunity to do so came about a year later when my wife and I picked up and moved from our little bungalow by the beach to a "real" house at the base of the lofty peaks of the Rocky Mountains in the Boulder, Colorado area. 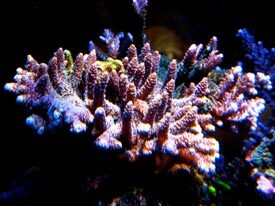 The sadness of knowing I would have to give up my gardening hobby was offset by the exciting prospect of a new, better, larger reef tank. 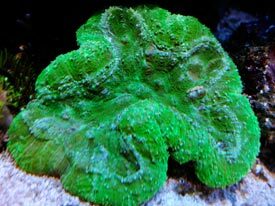 Much to my surprise, I found the Denver/Boulder Colorado area to have a thriving reef hobby community with many superb dealers. 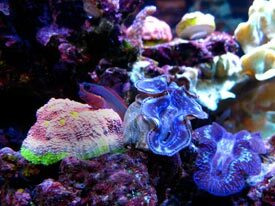 I was thrilled my "underwater gardening" hobby could now be a year-round pursuit on a larger scale with many resources at my disposal. 1. 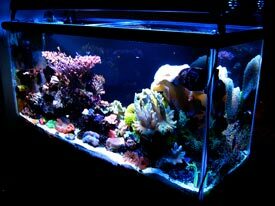 A "peninsula" style tank viewable from 3 sides. 2. No rocks touching the glass. 3. Viewable while sitting on the couch with the pug (the lump of fur and wrinkles in the photos below). In the rush of excitement to get this new system up and running, I decided on an undrilled 90 gallon AGA tank with a somewhat minimal, platform-style AGA Geneva stand (didn't want a big "heavy" looking stand). In retrospect, I wish I would have gone with larger tank (90 seemed "plenty big" at the time) and built my own stand, for reasons I'll explain very soon. The tank, stand, sand, live rock and sump were delivered all in one day. Everything was moved into place and the tank was almost done being filled when I encountered my first problem-- the sump didn't fit in the compartment under the stand! When I placed the order for the stand I was so focused on the outward appearance, I neglected to confirm that it has adequate space beneath to fit all the equipment. Unfortunately, the AGA Geneva stand is divided into 3 separate compartments underneath that are each about 18" square-- not enough room for the sump I purchased.. If I would have had my wits about me at the time, I would have emptied the tank, returned the stand and made my own. Instead, I had the company go back to the store and immediately start constructing an 18" cube shaped sump. No baffles, no chambers, no bells and whistles. Just enough room for the drain line from the overflow, heater, protien skimmer, return pump and a couple small rocks-- essentially creating a basic, no frills Berlin-style system. 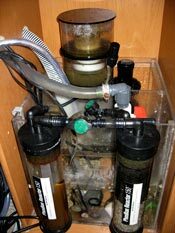 A few days later, the new sump was delivered, the siphon was started and the tank was officially up and running. 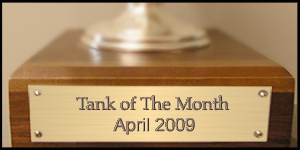 Unfortunately, all of my photos of the initial setup of the tank were lost in a hard drive crash. Though I still have many areas in which I can and want to improve/expand the overall system, I think my original vision for what I wanted this tank to look like has started to become a reality. 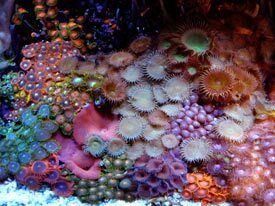 The tank is essentially setup into "zones"-- SPS on one end, softies on the other with LPS on the sandbed and in between among nooks and crannies in the rocks. Being viewable from 3 sides, it has allowed me to create 5 "vignettes" that I've intentionally arranged so that each one could essentially be taken from the tank and displayed on it's own. 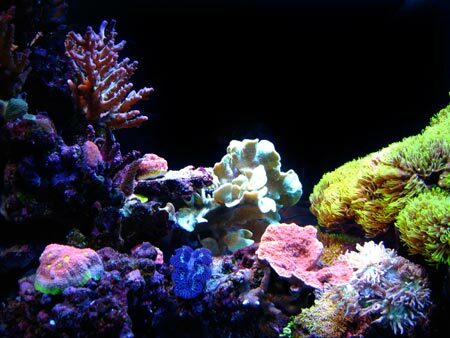 That is one aspect of the aquascape and tank arrangement I am very pleased with. The simplicity of my tank is both a blessing and a curse. It's a blessing in that its forced simplicity leaves very few areas for potential problems and a curse in that it's cramped, not as "clean" as I'd like it to be (external appearance-wise) and leaves me very little room for system addons in its current configuration. 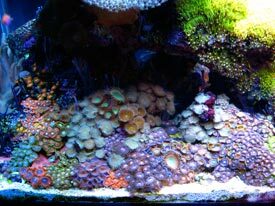 One thing I found most interesting when I first entered this hobby was the emphasis on simple, natural approaches to basic biological filtration in a reef tank-- out of necessity my tank takes full advantage of them. 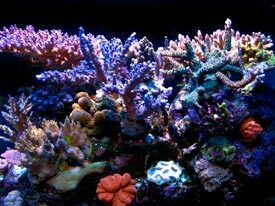 The tank contains a little over 100 lbs of Fiji and Tonga live rock and a 3-4 inch sandbed of mixed coarse and fine oolitic aragonite for biological filtration. Water goes into the overflow, to sump, gets "processed" to have organics stripped from it, then sent back to the display. 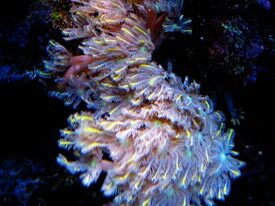 This "water processing" occurs with the help of AquaEuro USA 135 Protein skimmer and a dual Phosban Reactor setup. 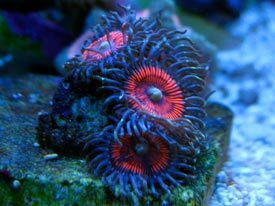 One reactor contains GFO, the other contains a quality GAC made for Reef tank use. 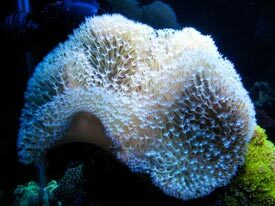 There are no inline filter pads, sponges or other basic mechanical filtration elements. 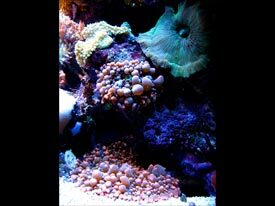 Despite the undersized sump and lack of a formal refugium, the tank has a large, thriving population of amphipods and mysid shrimp that can be seen scurrying among the rocks both day and night. This simple filtration setup served me quite well-- so well in fact that I quit testing for Nitrate for over a year. That changed last Fall when a powerhead on the back wall fell and kicked up the deepest part of the sandbed. After the water cleared I tested Nitrates and found the results to be bright red-- 40ppm, 60?, 80? All I knew was that it was not what it used to be or was supposed to be-- light yellow (undetectable). Water changes didn't help and I couldn't add more rock to the tank (no space), so I decided I'd start a carbon dosing routine. 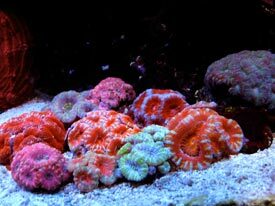 The Reef Aquarium Vol. 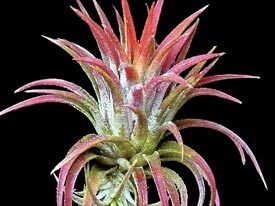 3 book made mention of a product called AZ-NO3 in the section on Nitrate Reduction techniques that seemed like it might be worth trying. 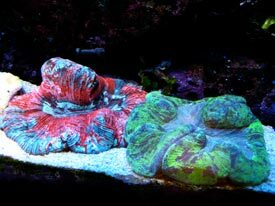 I ordered a couple bottles, added it according to the instructions and voila!-- Nitrate was back to undetectable in about 3 weeks and all the corals looked better than ever. 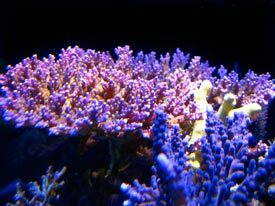 I noticed a dramatic increase in growth and color on both the stony and soft corals in the tank. 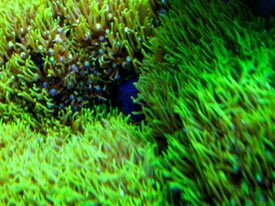 I don't know if it was the nutrient reduction that caused the improvement or if the corals themselves were actually feeding on the carbon source and bacteria. My guess is that it was probably a little bit of both. My Nitrate levels are now under control but I still maintain a low level maintenance dosing schedule of AZ-NO3 for additional nutrient reduction. 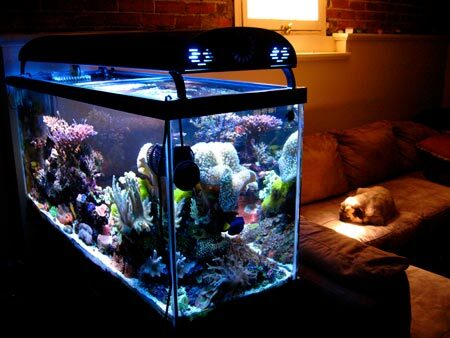 The installation of an inline refugium/frag tank is planned for this upcoming Summer. Water Movement: Two 12v Controllable Koralia 4 pumps with two-way controller. Again, very simple. Main return pump is a 500GPH Danner Mag Drive submerged pump that is fed by an Amiracle external U-tube siphon. Though many people curse external siphon overflows, it's actually smaller than an internal overflow and has never lost siphon the 2 1/2 years of using it, despite numerous power outages and weekly shutoff for maintenance. 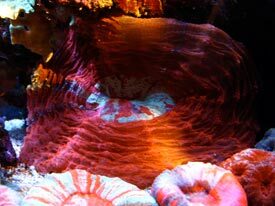 Circulation within the tank has been an area I have experimented with quite a bit. I've tried nearly every affordable powerhead on the market with a variety of timers, mods, and positions in the tank. After burning up a couple dozen modded Maxi-Jets on a wave timer, I finally invested in a pair of the new controllable Koralia 4 powerheads with their two channel controller last Fall. 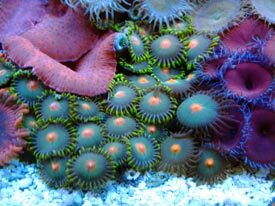 The powerheads are positioned at opposite ends of the tank in the upper corners and are set on a 15 second alternating cycle. I'm very satisfied with their silent operation (no more clattering propellers) and the flow they provide. I'd prefer not to have any powerheads in the tank at all, but this setup is about the best arrangement I can have short of a wavebox. Lighting for the tank is provided by a 48" Current USA Outer Orbit fixture containing 2 X 150W DE MH and 2 X 48" 130W dual actinic PC bulbs. Metal Halide bulbs are another area I've done a lot of experimenting. 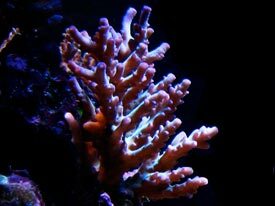 The dynamics of growth and color provided by different lighting setups is of great interest to me and I've tried many combinations in this fixture. 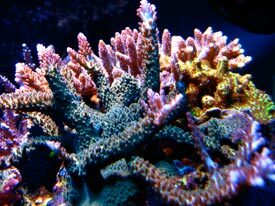 I've (almost) settled on 12K Reeflux over the SPS side and switch between 14K Phoenix and 20K Ushio over the softie side as my personal favorite combination. 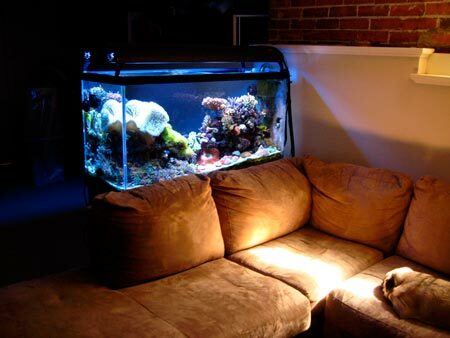 When available, I also take advantage of natural sunlight that passes over tank in early Spring and Fall (shown above). Next step I'll be taking in the realm of lighting will be an upgrade to a 250W fixture. 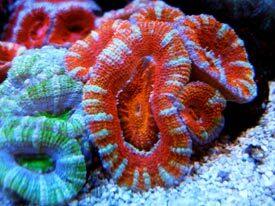 Routine maintenance involves a weekly general clean up along wth 10 gallon water change using Reef Crystals salt (usually) mixed with water from a 3 stage undersink RO filter in the kitchen. Our local water supply comes largely by snow melt from the local mountains. This provides is a relatively high quality tap water (in this day and age) with a TDS below 5 after running through the 3 stage RO system. Skimmer cup is cleaned during this weekly maintenance routine and the GFO and GAC are changed out roughly once/month. Topoffs are accomplished using a JBJ ATO system fed from an 18 gallon Rubbermaid storage bin that sits outside the tank. Concealing this equipment is a part of my plans for babyproofing improvements. 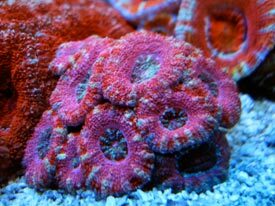 For whatever reason, I've never had issues maintaining Calcium with this tank (Reef Crystals, perhaps? ), but constantly battle low Alkalinity and Magnesium levels. General supplementation comes from Kalkwasser via the topoff system and 2 teaspoons of plain baking soda added as needed (typically twice/week). I'm constantly trying new Magnesium supplementation products. Plans to solve this issue once and for all with the use of a calcium reactor are in the back of my head. 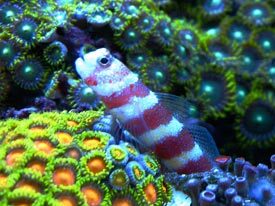 The fish and corals are fed overy other day with a combination of PE Mysis (thawed and thoroughly decanted) and red label Rod's Food. 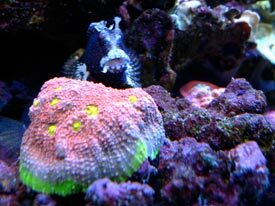 Green Sea Veggies is offered in a clip 2 times/week for the Tang and Starry Blenny-- both devour it with gusto. 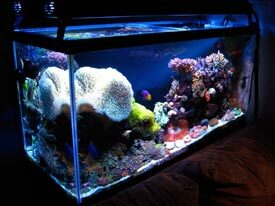 I will admit to having a heavy fish load in this tank but all are extremely healthy and aggression is rare. 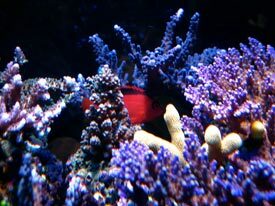 The open aquascape of the tank allows plenty of open space for fish to roam as well as numerous hiding spots, into which all my fish quickly retreat as soon as the camera comes out. 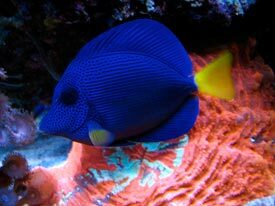 The lone exception is the Purple Tang who has a habit of getting in the way of whatever I am trying to photograph. 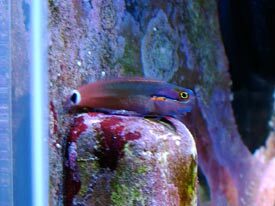 I also have a badge of shame-- one fish I never should have added-- a yellow damsel I was given as a half dead baby less than an inch long by an employee at a local big box pet supply store. Not only did the fish survive, it's grown quite large and extremely healthy. It reminds me of the mistake I made in saving its life by biting me repeatedly whenever I'm working in the tank. I won't give him the pleasure of having his picture shown here...haha. 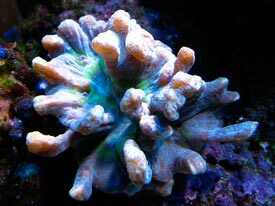 I have a love of all types of corals. 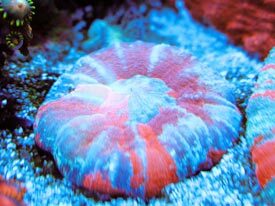 I don't care whether they are hard or soft, LPS, SPS, mushrooms, solitary or spreading-- my only concern is their color, form, and a decent track record of survival in captivity. As a result, my tank has a little bit of everything. 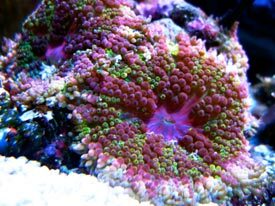 When I first set up this tank I was determined to take on some more challenging varieties of corals I hadn't tried before. 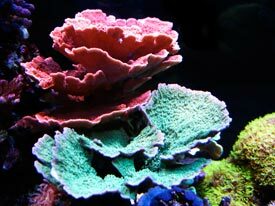 I set aside the top of one side of the aquascape as the "SPS Zone". 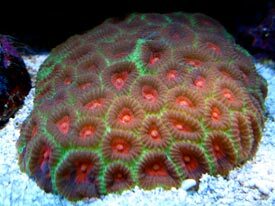 The primary "problem" I've encountered is their rapid growth which causes them to overgrow each other and fight. I do periodically prune tips as needed, but the delicate balance of the rock work they are growing on makes major pruning a risky endevour. It only took one avalanche for me to learn that lesson. 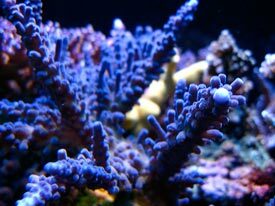 The other, more devastating issue I encountered during the past year was an invasion of the white Montipora eating Nudibranchs. I had a small outbreak last Spring that went away on it's own and the colonies recovered. 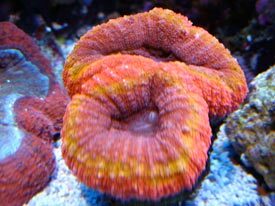 I thought they were gone, but returned with a vengance this past winter and left me with no choice but to remove my two large M. cap colonies that I had grown from quarter sized frags. 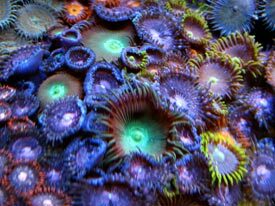 Pictures of these corals at their peak of beauty are below. 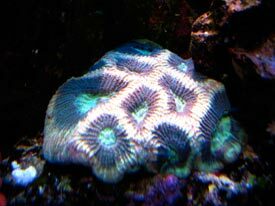 While it was a huge disappointment to lose these corals, they were quite large so their removal opened up a large area in the middle of the tank that has allowed me new space to populate. 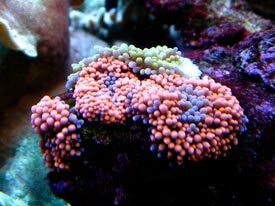 I did save one small frag of the orange cap that I've reattached and has already started growing. 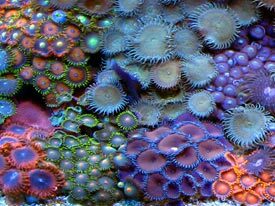 If I had to choose one type of coral to limit my self to, it would probably be the LPS corals. 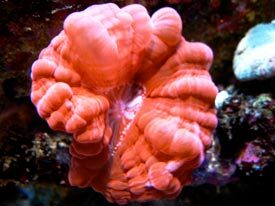 Their colors and forms are another endless source of fascination for me. 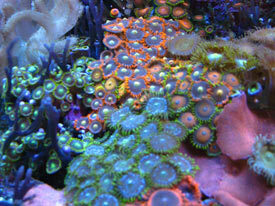 My tank contains many of my favorites scattered throughout the rock work and sandbed. 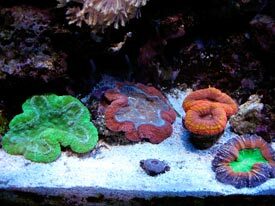 Trachyphyllia, Lobophyllia, Symphyllia, Acanthastrea, Australian Favias, Scolymia and Cynarina. I'm always on the lookout for new ones. 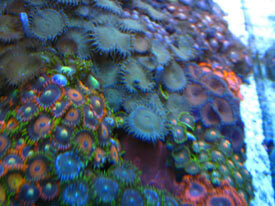 One of my favorite corals in the tank is the large single green, orange & purple polyp. 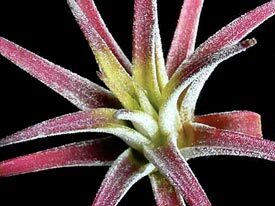 I'm not entirely sure what it is, as it has been agressive to both Lobophyllias and Symphyllias it has made contact with. 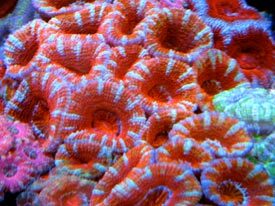 Soft corals often get a bad rap as low grade, beginner corals that aren't worth devoting tank space. I whole heartedly disagree with this notion. 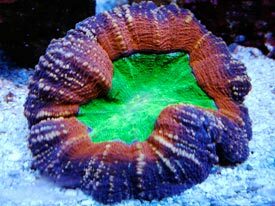 It is true that many are relatively easy in comparison to the demanding SPS princesses, but there are many varieties in the trade now that defy the "brown coral" stereotype with intense green, blue and multi-hued color forms. 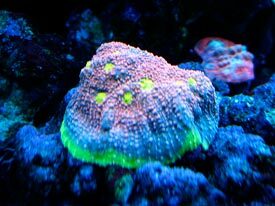 I think the long, waving polyps and soft curves of the giant white Sarcophyton toadstool (10" across-- will be trimmed soon) that dominates the softie side of the tank are hypnotizing. 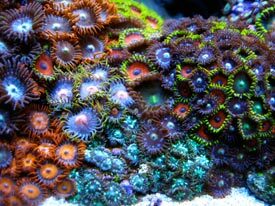 Many people also comment about the large grassy "hillside" of GSP in my tank by saying I'm crazy for putting that stuff in my tank. 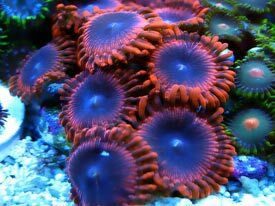 Yes, it is a vigorous grower that needs to be kept in check with frequent pruning/peeling, but its intense color, waving motion, and low growing, spreading habit provides a provide a wonderful visual contrast to the motionless "stiffness" of the stony corals. The way it has grown to hug the contour of the rock slope provides some much needed negative space in an otherwise visually crowded environment. 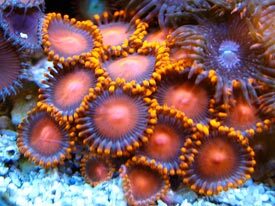 It's the "Zen" in my tank. 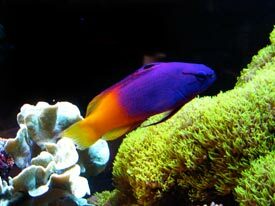 The picture below shows the Royal Gramma peaking out of his cave in the GSP rock. 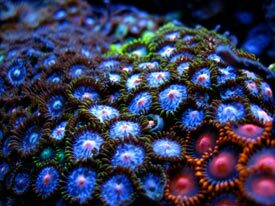 Zoanthids were some of the first corals that I became interested in and they remain one of my favorite coral families to this day. 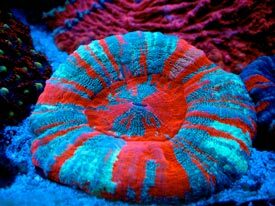 Not only are they incredibly simple to care for, they come in a dizzying array of colors with new varieties entering the market all the time. While I have an appreciation for many of the high-priced named varieties, I most enjoy coming across random finds at stores, mixing them together and periodically "re-doing" the garden with different varieties. 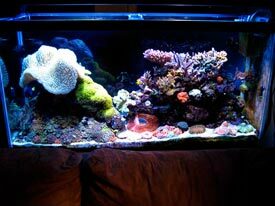 Thanks again to Reefkeeping Magazine and the Reef Central community for giving me the honor of highlighting my tank as this month's TOTM. 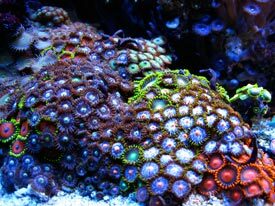 Without question, its success is due in large part to what I've learned (and continue to learn) from the many enlightening discussions on the Reef Central message board. Special thanks also go to my wife for (reluctantly) helping me lift the light fixture to change bulbs and my daughter for giving me a reason to keep the glass clean. Grow big & strong so you can help Daddy carry water buckets some day.